Happy Holidays & All The Best For 2016 From Greenland Or Bust. Happy Holidays! We at Greenland or Bust wish you, your family and your friends a wonderful festive season. In November, Helen taught Traditional Paddling and Rolling and Simplifying the Roll at Horseshoe Cove in California. Mark ran some BCU and ISKGA programs in Cornwall, England and on Anglesey, in Wales. In January we've got some local programs running, and Helen will be completing her Wilderness First Responder. In February there's Paddle Golden Gate. It's an awesome event, and well worth checking out, if you haven't done so already. 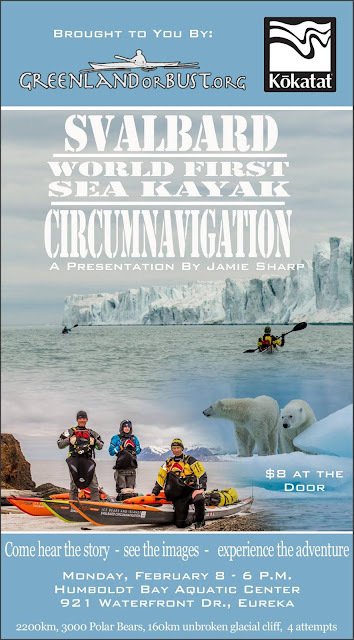 After that, Greenland or Bust and Kokatat are bringing Jaime Sharp to Eureka, California for Ice Bears and Islands, a presentation on Svalbard's world first sea kayak circumnavigation. For more, please see the flyer below, or e-mail info@greenlandorbust.org. Later in February, we head to the UK for the 8th UK Storm Gathering Symposium, which takes place on Anglesey in Wales from February 20 to 22. The main event will be followed by BCU and ISKGA Week. Finally, our next Greenland expedition takes place in the Disco Bay/Ilulissat area from July 20 to 31, 2016, and there are only a couple of places left! Contact us at info@greenlandorbust.org for more information. Proper Planning And Preparation Will Prevent a Poor Performance - Get to know the area where you will be tested. Paddle it a few times in different weather/tidal conditions, so your chart is there as a backup, not as your primary means of knowing your location. Fail to Prepare, Prepare to Fail - Set out lots of 'desk-top' plans beforehand, so when on the water you can create several 'deck-top' plans in your head, at any one time: a five minute plan, a 30 minute plan and a one hour plan. Your aim is to be implementing the 5 minute plan, working towards the 30 minute plan, and keeping the one hour plan in perspective. Be Brave. Take Risks. Nothing Can Substitute Experience - If you are 'experienced' then it stands to reason that you will draw confidence from having built up a breadth of personal knowledge, thus enabling you to make sound judgment calls as and when they are required. Come Prepared To Take The Helm - If you are not so 'experienced' then you need a bombproof game plan or live on your wits, which will be stressful! This is the hardest way of passing; a good examiner will detect a candidate's lack of flexibility and will try to force judgment calls, potentially then forcing mistakes to be made. After all, they need to see if a candidate is safe in any situation. To Prepare Is Half The Victory - Be ready to use your safety equipment, especially your towline, more than once and often in quick succession. Sort out an effective roll and be ready with a quick re-entry; this is a set piece and really highlights good paddling skills, or lack of. Make sure the kit you have is functional, accessible but also easily stowed and secured. Stay calm and do what you always do, not what you think someone else wants you to do. "Be prepared, work hard, and hope for a little luck. Recognize that the harder you work and the better prepared you are, the more luck you might have" - Ed Bradley. Kayak 'season' is only just now slowing down for us here at Greenland or Bust. It has been a WONDERFUL year. We've run classes and taught at symposiums in Wales, Mexico, Sweden, Norway, Denmark, England and the U.S. (South Carolina, California, Minnesota and Oregon). In addition to all of this, we also had our first Storm Gathering USA event, which took place in Trinidad, California. Now we've got a little time to reflect on the past twelve months and get working on next year's schedule. October started with Simplifying the Roll and some private classes on Anglesey, in Wales. Then we went to Cornwall, England for the Sea Kayaking Cornwall Symposium. After that, Helen headed to Pacific City, Oregon, for Lumpy Waters. This weekend she hosts a Halloween Campout at Stone Lagoon (California) for our local club, Explore North Coast. Mark remained in Cornwall to teach various BCU and ISKGA (http://www.iskga.com) programs before finishing the month with some sea kayak skills development courses, including an ISKGA Fundamentals Level 1 in North Wales. 2016 will be a very busy year, but there's two events that you should lock into your calendar now. February 20 to 22 is the 8th UK Storm Gathering Symposium, which takes place on Anglesey in Wales. The main event will be followed by BCU and ISKGA Week. 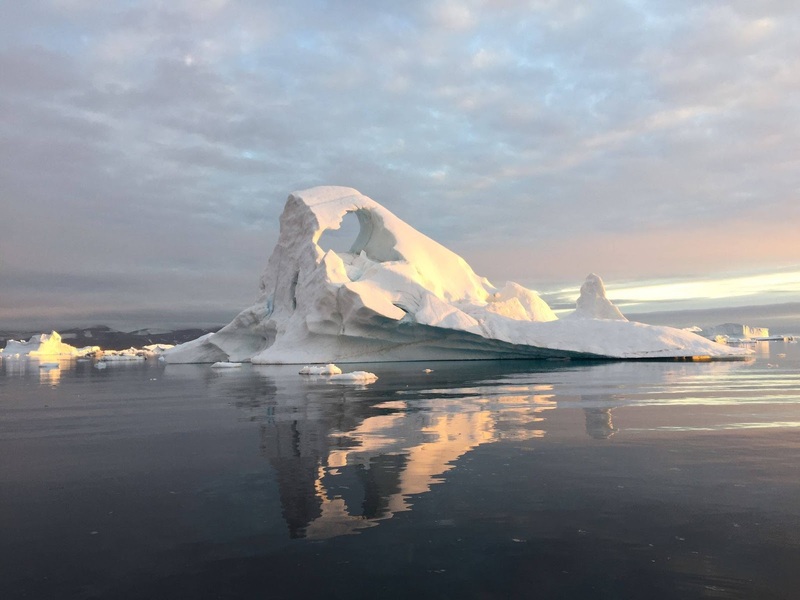 Second, our next Greenaland expedition takes place in the Disco Bay/Ilulissat area from July 20 to 31, 2016, and there are only a couple of places left! Contact us at info@greenlandorbust.org for more information. Answer: A hand roll is very similar to a Butterfly Roll. To progress to this roll, it's a good idea to first fine tune your Butterfly Roll. Following are the steps to a solid Butterfly Roll (described with a right side recovery). - During the capsize, keep your paddle in contact with the kayak. Your paddle should remain in contact with the kayak throughout the underwater set-up position. - Once there, explode, opening your left arm and driving with your right knee at the same time. Opening your left arm should put shoulders square to the surface of the water. - Put your chin into the air, and slide onto the back deck. Expedition participants often ask us about recommended reference material so they can learn more about Greenland, so we have complied a list of books and resources that may be of interest to you. Please help us keep the list relevant and let us know if you think something that should appear here. The Sledge Patrol (1957) by David Howarth. A Naturalist's Guide to the Arctic (1995) by E. C. Credit Bendt-Moses Jensen. A Complete Guide to Arctic Wildlife (2012) by Richard Sale. An African in Greenland (2001) by Tété-Michel Kpomassie. This Cold Heaven - Seven Seasons in Greenland (2003) by Gretel Ehrlich. Greenland - The End of the World (2010) by Damjan Koncnik. The First Crossing of Greenland (1892) by Fridtjof Nansen. Greenland by the Polar Sea (1921) by Knud Rasmussen. Dancing on Ice - A Stirring Tale of Adventure, Risk and Reckless Folly (2009) by Jeremy Scott. Eskimo Folk Tales (1921) by Knud Rasmussen (Ed). No One Thinks of Greenland (2002) by John Griesemer. The Greenlanders (2005) by Jane Smiley. The Wedding of Palo (1934) - It tells the contest between two rivals for the love of an Inuit woman. The forces of nature will decide the winner. The Journals of Knud Rasmussen (2006) - European explorers change the lives of an Inuit community while exploring the Arctic in 1922. Village At The End Of The World (2012) - A witty, surprising and ultimately feel good portrait of an isolated village of 59 people and 100 sledge dogs, surviving against the odds. Acknowledgements: We are grateful to past expedition participants for helping us refine this information. We're writing this newsletter from Anglesey, Wales. Here on Anglesey, it's starting to feel like Autumn. Temperatures are dropping, clouds are filling previously clear blue skies and t-shirts are being replaced by warm hoodies. Despite the weather change, there are lots of kayaks on the water. We hope that this also holds true in your neighbourhood. September began with us traveling home from a busy summer of classes and events in Norway, Sweden and Denmark during our sixth annual, Rebel Kayaks supported Nordic Tour. After a couple of days of rest and relaxation, Helen then headed to Lake Carlos State Park in Minnesota to mentor during the Traditional Paddlers' Gathering. She then made her way to Whiskeytown, California for a couple of Simplifying the Roll classes, and then traveled down the coast to run private rolling classes during Mendo Madness in Mendocino, California. Meanwhile, Mark ran a BCU 4 Star Sea Training Week, which was then followed by a BCU 4 Star Sea Assessment. Both were in Pembrokeshire, Wales. In addition to all of this, we've been working on our 2016 schedule, which is already filling up FAST. October started with Simplifying the Roll and some private classes on Anglesey, in Wales. This week we head to Cornwall, England for the Sea Kayaking Cornwall Symposium. After that, Helen heads to Pacific City, Oregon, for Lumpy Waters, then to Eureka, California for an Intermediate Sea Kayaking class. She ends the month with a Halloween Campout at Stone Lagoon, an event which she's hosting for our local club, Explore North Coast. Mark will remain in Cornwall to teach various BCU and ISKGA programs before finishing the month with some sea kayak skills development courses back in North Wales. Most of our winter programs will then be in California (Horseshoe Cove, Crescent City, San Diego, Marina Del Rey and Dana Point). 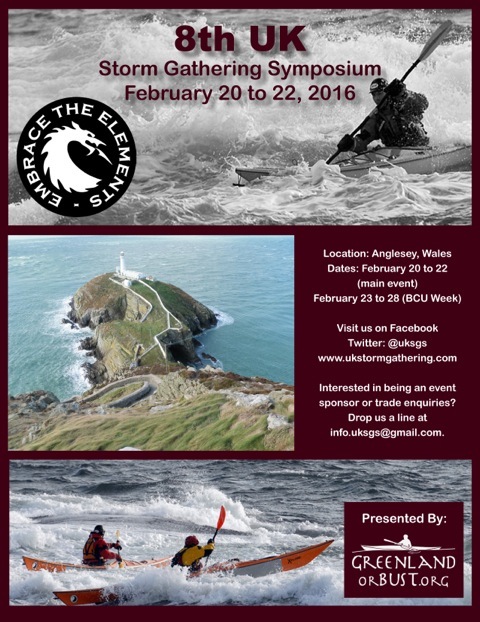 In February, we head back to Anglesey to run the 8th UK Storm Gathering Symposium. Will you be there??? Over the past few months, we have been looking at the various factors which make up the ‘TTPP model’ (BCU, 2006) as they relate to paddling performance. In December, we introduced the model. In April, we covered the ‘Technical’ element. In June, we addressed the ’Tactical’ aspect and, in August, we talked about the ‘Psychological’ dimension. for exercise and our diet, can also help address performance issues. To recap, this element represents our ability to develop endurance, maintain flexibility, generate strength as well our balance nutritional needs depending on the level and intensity of the activity we are participating in. It also relates to the application of sound training principles and adopting specific fitness strategies. For example, a lack of muscular endurance, aerobic fitness, or poor nutrition while paddling could undermine our physical ability. These areas can be addressed by scheduled aerobic exercise, circuit training, along with a review of food and fluid intact during activities to see if any useful changes can be made. Whether training to compete or training for health, everyone has different needs. People vary in height, size, shape and preference. Therefore, even though they have the same goals they may not reach them by the same means. However, the following areas often need addressing in some form or another. Core Strength: This can be developed through exercises that enhance the muscles required for rotational movements of the trunk and abdominal areas. For example, you can build strength in your lower body by using squats and leg extensions. For abdominal strength and torso rotation try crunches using a balance ball. Cardiovascular Training: Cardiovascular fitness for kayaking requires some discipline specific training so consider the duration and distance of each trip. For example, plan to kayak for a set distance in one direction and then return to the starting point. Therefore encountering different conditions. On the next outing increase the distance. During the paddle, aim for a consistent cadence of stroke, or pace. Incorporating staged bursts of speed, either for a set time or number of paddle strokes, will also help with improving speed. Cross Training: As with any activity that requires cardiovascular endurance, cross-training using high-intensity aerobic exercises, such as cycling and running, can improve fitness levels. While the movement patterns for biking or running do not simulate kayaking movements, developing endurance ensures a kayaker won't be stranded on the water too tired to paddle to safety or back to shore. Flexibility: This refers to the absolute range of movement in a joint or series of joints that is attainable in a momentary effort with the help of a partner or a piece of equipment. Flexibility in some joints can be increased to a certain degree by stretching. Stretching improves the muscle's felt elasticity and reaffirms comfortable muscle tone. The result will be a feeling of increased muscle control, flexibility and range of motion. If you are not training for a particular paddling discipline, then you need to consider your height, weight, gender, body shape, and goals before you choose a suitable fitness program. However, it is worth applying the FITT Principle once a training structure has been set. For each type of exercise during your session, think about the following. Frequency - How often you do the exercise (be it an individual set or the whole session). Intensity - The difficulty of the exercise: it could be the amount of weight, or the speed you move. Time - The duration of the exercise: for fitness, this should be at least 20 minutes a day. Type - What kind of exercise: vary what you do to keep it interesting, and to work all the different muscles. Nutrition and Hydration: Optimal nutrition is attained with sound dietary practices that are applied on a continuing basis, not just before a long paddle. Getting into a good eating pattern long term and fueling-up with the right energy sources not only provides a nutritious diet but will help prevent fatigue when out paddling and allow you to continue to perform at your best for longer. One aspect to avoid is dehydration, which is one of the most important factors that can cause early fatigue during exercise. It decreases performance, impairs cardiovascular function and can pose serious health problems. For proper hydration, drink before, during and after exercise and before you feel thirsty. A balanced training programme develops good cardio fitness and body strength while adding finesse to your paddling efficiency. Effective stroke techniques increase as you put in more time on the water. Please note that we have moved all matters relating UK Storm Gathering Symposiums to WordPress. Thank You & Happy Paddling! We're writing this newsletter from a hot and sunny Malmo, Sweden, the second to last stop on this year's Rebel Kayaks supported Nordic Tour. This year's Tour ends tomorrow, and we can't believe that it's almost over. It has been a wonderful summer! We've met lots of great people, seen lots of fantastic places and worked with over 1,000 incredibly awesome people. THANK YOU to everyone that has been part of our summer! Throughout August we ran Simplifying the Roll and a BCU Coastal Navigation and Tidal Planning class during Värmlands Paddelfestival in Karlstad, Simplifying the Roll and an instructor training day in Helsingborg (both in Sweden), Simplifying the Roll in Rungsted, Simplifying the Roll and technique classes in Frederiksvaerk and Simplifying the Roll during the Gronlandsk Symposium in Svendborg (all in Denmark). This weekend we'll be running Simplifying the Roll, Simplifying the Rescue, Incident Management and Yoga for Paddlers in Malmo and Simplifying the Roll in Karlshamn (both in Sweden). Later in September, Helen will be teaching Simplifying the Roll at Big Lagoon, in California, and then heading to Minnesota for the Traditional Paddlers' Gathering, taking place at Lake Carlos State Park. After that she'll be teaching Simplifying the Roll and Simplifying the Rescue at Whiskeytown Lake in California, followed by a trip to Mendocino to run private rolling classes during Mendo Madness. Later in the year we'll be teaching Simplifying the Roll and Combat Rolling together on Anglesey, then heading to the Sea Kayaking Cornwall Symposium in Southern England. Helen then heads to Pacific City, Oregon for Lumpy Waters. Most of our winter programs will then be in California, until February, when we head to Anglesey to run the 8th UK Storm Gathering Symposium. Will you be there??? 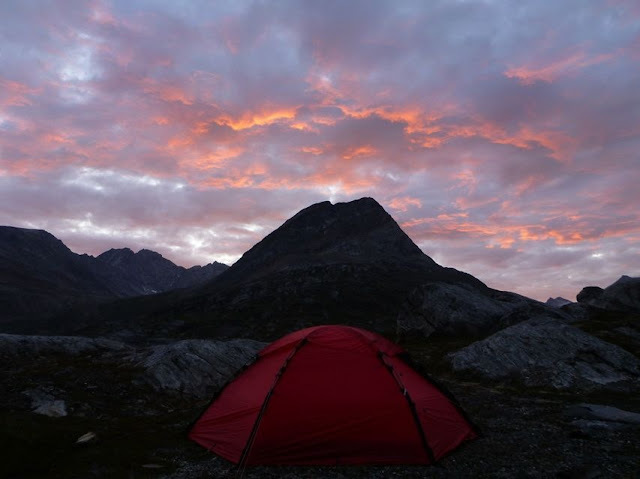 And finally, are you interested in joining us for a Greenland expedition? The dates and location have been set! Next year's expedition will take place in the Disco Bay/Ilulissat area from July 20 to 31, 2016. Contact us at info@greenlandorbust.org for more information. For us here at Greenland or Bust, it has been a wonderful summer. We hope that you're having just as much fun as we are, both on and off the water. We're writing this newsletter as we leave the east coast of Sweden and head west, running classes as we make our way to Denmark. Time flies, and we can't believe that we're already ten weeks into this year's Rebel Kayaks supported Nordic Tour! Throughout July we ran Simplifying the Roll in the charming fishing town of Grebbestad; Simplifying the Roll, Incident Management and Intermediate Boat Handling in the magnificent city of Stockholm; Simplifying the Roll in Mora, a place which is often referred to as "the heart of Sweden"; Simplifying the Roll, a BCU 3 Star Sea Training, a BCU 3 Star Sea Assessment and a BCU 4 Star Sea Training in the beautiful archipelago surrounding Nynäshamn; and a guide training program on the stunning island of Sandhamn, which is located off the east coast. All of these locations are in Sweden, and yet all of them are very different from one another, and the diversity has made this year's tour incredibly fun. In addition to on-water classes, we've also ran 15 sessions of Yoga for Paddlers. We're currently on our way to Lake Vänern near Karlstad for the Värmlands Paddelfestival, after which we head to the west coast for two days of classes in Helsingborg before hopping on a ferry to Denmark for classes in Rungsted, Frederiksværk and Svendborg. We'll be in Denmark for most of August, and then we end the tour in Malmö and Karlshamn (Sweden) before heading home in early September. Click HERE for our complete 2015 Nordic Tour schedule. This is the sixth year of the Nordic Tour, and every year it's great to be back and catch up with our Scandinavian paddling friends. It's also great to make so many new friends each year. Special thanks to Rebel Kayaks for supporting the tour, as well as the clubs, businesses and organizations that put the classes together in their neck of the woods, and a HUGE thank you to all of the participants. The tour ends in September, but "kayaking season" will keep going full swing. We hope that you'll consider joining us for a class in California (Trinidad, Whiskeytown Lake, Mendocino, Dana Point, Marina Del Rey) or Wales (Pembrokeshire, Anglesey), or perhaps we'll see you at one of the symposiums that we'll be teaching at in the remainder of 2015 (Traditional Paddlers' Gathering - Minnesota, Sea Kayaking Cornwall Symposium - England or Lumpy Waters - Oregon). In other news, Greenland or Bust is excited to announce that we are now an authorized center for the International Sea Kayak Guide Association (ISKGA) in the United States (located in Arcata/Trinidad, California). We're both ISKGA guides and are really excited to be running ISKGA training modules and observations. In April’s newsletter we talked about the ‘technical’ element of the BCU’s TTPP model, and in June’s edition we covered the ‘tactical’ aspect, as they relate to the development of a paddler’s performance. This month we focus on how a kayaker’s use of psychological tools can help achieve successful outcomes. To recap, this element represents our ability to overcome anxiety, manage arousal, determine confidence levels and understand motivational reasoning. Adopting good psychological strategies and using goal setting techniques can help moderate these emotional states, thus enabling a person to perform under pressure. To assist an individual to master their anxieties, somatic techniques (e.g. relaxation) and cognitive techniques (e.g. imagery) can be used. Goals setting can help us gain greater control of achieving our paddling objectives because they specify what we need to work towards (thus giving direction) and the amount of effort required to achieve that target (levels of intensity). This in turn will increase our levels of motivation and self-belief. Goal setting provides structure to a training program and is a useful tool in measuring progress. Establishing short, medium and long-term goals creates an opportunity for rewards (if you succeed in meeting each goal) or for reviewing your training needs (if you don't meet a goal). Relaxation techniques are seen as powerful aids to managing our emotional states and can have a direct affect upon our confidence levels. Progressive relaxation methods, along with energizing activities, prior to paddling, can have a positive effect on anxiety levels while on the water. Imagery, visualization, mental rehearsal and mental practice all refer to creating or recreating an experience in the mind. This approach involves either retrieving an experience from memory and using it in a meaningful way, or creating an image of a new experience from cues or visual aids. Imagery, as a tool, can be used to center the mind and help us focus on what we want to achieve. It involves mentally rehearsing a performance and can be done on the beach; in a car park; even while paddling. Visualization involves picturing what a successful performance of a task might feel like. Some people like to hold the paddle and physically go through the motions of the maneuver they are about to perform (e.g. rolling; entering the flow), while others prefer to build a picture in their minds-eye of how they might apply a technique or complete a maneuver successfully. Applying Psychological tools, such as arousal management and mental rehearsal, along with the use of goal setting, will enhance our paddling performance and improve our Technical ability as well provide us with greater confidence in being Tactical when kayaking. The final element to be looked at in the TTPP model is that of a paddlers’s Physiological development, including endurance, flexibility, strength, hydration and nutrition… but more on that next time.